The Concordia Stingers men’s hockey team woke up this morning out of the Ontario University hockey playoff picture. A 3-2 overtime loss to rivals McGill on Wednesday and a 5-3 loss to the UQTR Patriotes this weekend bumped the Stingers to ninth overall in the eastern conference. “We got to come out and put our foot on the gas and keep it on the gas for 60 minutes,” said Stingers head coach Kevin Figsby. The Stingers began the week with a highly-anticipated matchup against the third-ranked McGill Redmen. The visiting Stingers squandered a 2-1 lead against their cross-town rivals with 13 seconds remaining when Redmen forward Guillaume Monast took advantage of a defensive turnover and roofed a shot up high on Stingers goalie Antonio Mastropietro. Two minutes into overtime, Redmen forward Jonathan Brunelle took a nifty pass from Ryan McKiernan and wired a shot past Mastropietro from the slot to win the game. Mastropietro was spectacular in the loss, finishing the game with 33 saves. While the Stingers tried to turn the page for Saturday afternoon’s game against the UQTR Patriotes, Concordia squandered a lead, yet again. After opening the game with consecutive goals by George Lovatsis and Alexandre Monahan, the Stingers allowed two quick goals of their own. Patriotes forward Felix Petit, who was left unguarded on Mastropietro’s doorstep, took advantage of a Concordia penalty midway through the first period to score his ninth goal of the season. Seconds later, the Patriotes scored again when forward Pierre-Olivier Morin found Marc-Olivier Mimar alone in and around Mastropietro’s crease for the easy goal. After an uneventful second period, in which the Stingers were outshot 13-7, Concordia came out in the third period with a boost of energy, establishing an offensive presence. 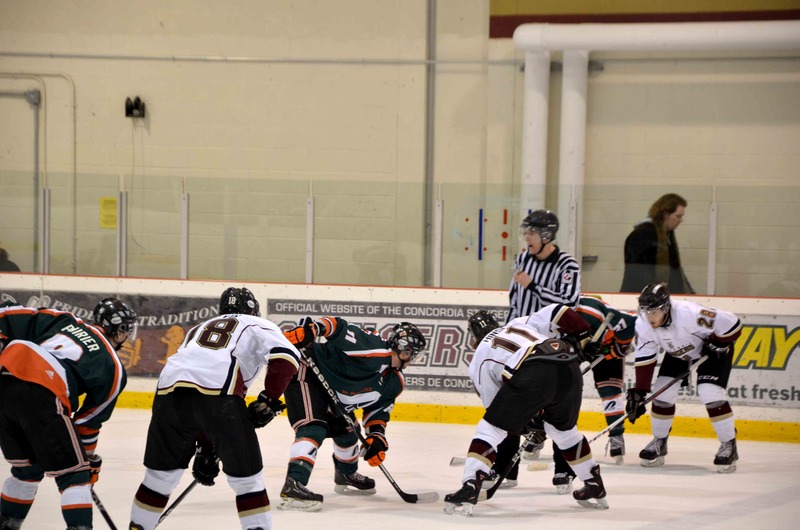 A controversial penalty, called by the officials against Concordia forward Corey Garland for hooking, changed the tone for the balance of the game. The Patriotes quickly took advantage on the powerplay when Emmanuel Boudreau potted his third of the season. With less than five minutes to go in the game and the Stingers trailing 4-2, Monahan sped by two sleeping Patriotes defensemen and slipped the puck past goaltender Guillaume Nadeau for his seventh of the season, pulling Concordia within one. Monahan finished the game with three points, two goals and one assist. But when Stingers defensemen Lyle Van Wieren took an unnecessary high sticking penalty during the games final minutes, it was all over. A late powerplay marker by Morin finished the Stingers. The Patriotes won the game 5-3. It’s worth noting Concordia was without top defenseman Youssef Kabbaj who was out with the flu and their captain, Kyle Kelly was suffering from a separated shoulder. Coach Figsby said the team is currently battling more than just a string of losses, but a midseason influenza that has affected six players thus far. The Stingers will face UQTR once more this Friday at Ed Meagher arena. Puck drops at 7:30 p.m.